Allelopathy is a form of amensalism, an association between organisms in which one is inhibited or destroyed and the other is unaffected through the release into the environment of secondary metabolites called allelochemicals. Allelopathic plant interactions has been known since the 4th century before Christ (BC), but only in recent years they have received an appropriated attention from international scientific community and farmers. Nowadays, in modern agriculture, allelopathy play a key role in maintenance the sustainability of agroecosystems through the adoption of environmentally-friendly strategies such as crop rotation, cover or smother crops, intercropping, crop residue incorporation, mulching and bioherbicides. Crops showing allelopathic properties are numerous: they include arboreal and herbaceous species as well as many weeds. 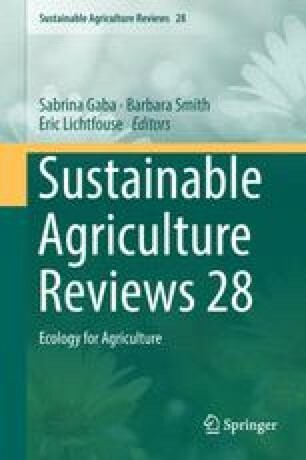 Here we review the general principles and the basic aspects in the field of allelopathy and why they are important in developing innovative sustainable agricultural techniques in agroecosystems for weed control, crop protection, and crop re-establishment with respect of environmental, human and animal health. Particularly, we describe the guidelines for distinguishing allelopathy from competition in field conditions, as well as the chemical nature of allelochemicals. Secondly, we review the volatilization from living parts of the plant, the leaching from aboveground parts of the plant, the decomposition of plant material and the root exudation, which are the major pathways for the release of allelochemicals. Third, we review the influence of abiotic and biotic stress factors on the quantity of allelochemicals released by the donor plant and the effects of allelochemicals on the target plant. Light, temperature, water deficiency, minerals availability, soil characteristics and many biotic factors modify the production of allelochemicals and the sensitivity of target plants. Finally, the interference of alleochemicals with plant physiological processes was also reviewed. Allelopathic compounds rarely act alone, but generally generate “multiple cascating effects”. Allelopathic mechanisms influence plant successions, invasion, spatial vegetation patterns, mutualistic associations, soil nitrogen cycle, crop productivity and crop protection.